Alastair Campbell's 'personal' and highly subjective diaries make the claim that 'CFR' Rupert Murdoch pushed/'forced,' servant to the Banker and Corporate elite, Tony Blair, into the Iraq war! Now think before swallowing; the source is the diary of a UK politician and 'rides' with a given -- few informed analysts and commentators would doubt Murdoch's elitist credentials and his desire to push the PNAC plan; HOWEVER, Tony Blair, the most gushing faithful servant to the elites required no 'force' or urging to unswervingly serve his Banker and corporatist masters, which is bloody obvious. Tony 'JP Morgan' BLAIR, for pete's sake! So where does that place the 'Independent' article? Somewhere between in-credible, suckered or a veiled attack on megalo Murdoch, who has gotten too big for his boots. 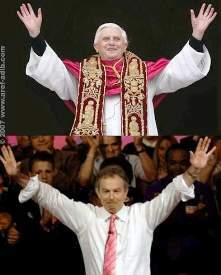 But you judge for yourselves, but never forget the gay abandon with which sociopath Blair pursued the elitist agenda. Blair was always a very willing member of the coalition of willing mass murderer criminals, he outshone both Bush and Howard in his service to the nefarious monied cabals -- "forced," not likely! This is really a lesson in media analysis; read the following story in its historical context, not like an American, whose cultural/historical memory is wiped clean ever y 24 hours! Rupert Murdoch launched an “over-crude” campaign to force Tony Blair to speed up Britain's entry into the Iraq war, according to the final volume of Alastair Campbell's diaries. Mr Blair's former communications director accuses the media mogul of being part of a drive by American Republicans to drag Britain into the controversial war a week before the House of Commons even voted to approve the intervention in 2003. The claim is explosive because it appears to contradict Mr Murdoch's evidence to the Leveson Inquiry. The News Corp chief told Lord Justice Leveson in April: "I've never asked a prime minister for anything." 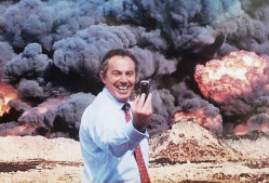 Mr Campbell's book, based on his extensive diaries during his 10 years working for Mr Blair, claims: "[Tony Blair] took a call from Murdoch who was pressing on timings, saying how News International would support us, etc. "Both TB and I felt it was prompted by Washington, and another example of their over-crude diplomacy. Murdoch was pushing all the Republican buttons, how the longer we waited the harder it got....TB felt the Murdoch call was odd, not very clever." In The Burden of Power: Countdown to Iraq which is being serialised in The Guardian, Mr Campbell casts doubt on Gordon Brown's claim to the Leveson Inquiry this week that he was not aware his close allies were trying to push Mr Blair out of Downing Street to that he could take over. According to Mr Campbell, Mr Brown agitated aggressively against Mr Blair, demanding a departure date soon after the 9/11 attacks in the US. He claims that Downing Street concluded in 2002 the then Chancellor was "hell-bent on TB's destruction". One charge that Mr Brown might accept is that he and Mr Balls "thwarted" Mr Blair's attempt to take Britain into the euro. Mr Campbell wrote in 2003: "Things just hadn't worked on the euro and TB was pretty fed up... The judgment was settling that GB had basically thwarted him. TB feared we were making the wrong decision for the wrong reasons." * Paul Jenkins, the lawyer who gave legal approval for Jeremy Hunt to oversee Rupert Murdoch's attempted takeover of BSkyB, is knighted today.